Will next mayor make or break the Strand Theatre? Home > Will next mayor make or break the Strand Theatre? What will the next mayor of Boston do with the Strand Theatre, the Uphams Corner landmark that debuted as a movie palace in the waning days of World War I? Like a Charlie Chaplin character flickering across its earliest screen, the Uphams Corner landmark stumbled and lurched across the 20th century and, on more than one occasion, damn-near plunged hat-first into an abyss of debt and decrepitness. And, like the ‘Little Tramp’ himself, the Strand has proven to be an enduring and endearing figure – with the promise of new audiences and a heroic revival that has been years in the making. But whether or not the Strand gets its Hollywood ending will hinge on the interest and guts of the city’s next CEO: Will he or she buy into Thomas Menino’s stubborn resolve that the Strand become Boston’s version of New York’s storied Apollo? Or choose to cut and run? In the early 1970s – after going dark for a few years – the Strand was saved from the wrecking ball by a non-profit community board that convinced Mayor Kevin White that the stage could enjoy an encore under city ownership, and indeed it did. In the ‘80s, the Strand tapped into close-to-home audiences thirsty for pioneering hip-hop tours, urban-edged musicals, and summertime youth theater troupes. The Strand has struggled at times in the Menino era . The non-profit board that saved the facility and guided it with firm leadership into the mid-1990s ultimately folded due to mismanagement, leaving City Hall officials with the unwelcome task of trying to book and maintain an aging money-pit building with few takers. As the clock ticks down toward Menino’s final weeks, it’s fair to say that the Strand is poised for such a renaissance moment— but it’s not there just yet. Thanks to extra hustle from Arts & Tourism chief Chris Cook, the Strand has partnered with a revolving cast of regional theatre companies to bring in top-flight productions, many of them with free or discounted box office deals for locals. Now, with state-of-the-art lighting and sound systems due to be installed over the winter, the city has finally found a consistent “resident” company willing to commit to multiple shows per year at the Strand. Fiddlehead Theatre Company  intends to mount two Broadway-caliber productions over the next six months, including Elton John’s “Aida.” The company also plans to revive the Strand’s once-popular youth theater programs, starting with an off-premises staging of the show “Fame, Jr.” set for this fall. While all of this is cause for optimism, the Strand’s pendulum could shift dramatically in the uncertain winds of City Hall politics, not to leave out close-to-home conditions in an Uphams Corner district that remains a hard-sell destination for unfamiliar audiences. All of the candidates sounded supportive notes about keeping the Strand alive, and helping it realize its “potential.” Most connected the Strand’s future  with the revitalization of Uphams Corner and the Dorchester community as a whole. But while some spoke in abstract generalities about the Strand’s role, a few of the candidates spoke with authority about the venue’s future— and about what they intend to do with the city-owned facility. Charlotte Golar Richie, a Dorchester resident who once had direct oversight over the Strand as chief of the city’s Department of Neighborhood Development, has an in-depth understanding of the theatre’s recent history, its potential upsides and pitfalls. Marty Walsh, the state representative from Dorchester who held his mayoral kick-off at the Strand in June, is also well-versed in its history. He is aided, in part, by Joyce Linehan, a key Walsh advisor who worked at the Strand during one of its heyday eras in the 1980s and is a respected voice in the region’s arts community. John Barros, who lives just steps away from the Strand on nearby Virginia Street, is another candidate with an intimate understanding of the place. “As Executive Director of [Dudley Street Neighborhood Initiative], I led efforts to engage with city agencies and private partners to refurbish the Strand and bring in culturally relevant programming that would increase attendance at Strand events. 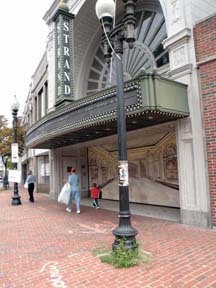 As mayor, I would complete the physical improvements begun under the Menino Administration, work with Uphams Corner Main Streets and local businesses to resolve parking issues around the Strand, ensure the theatre is fully programmed and greatly expand marketing and promotion of Strand events in order to make the Strand a destination point for local and regional arts patrons,” Barros wrote. Dan Conley, the Suffolk County District Attorney, emphasized that the theatre “needs public and private partnerships to maximize its great potential.” Conley was the only candidate to zero in on the potential impacts of the nearby Fairmount Line station, which he termed “[p]erhaps the greatest opportunity” to help strengthen the Strand.